One of our favorite acts of the past couple years is Deer Tick, a group known for their country-tinged 50’s era rock. With gravelly vocals and twangy guitars, Deer Tick is a perfect fit for the Tractor Tavern. Deer Tick has a brand new album up for grabs, and while it still has the same Deer Tick feel, the songs have increasingly embraced the band’s outlaw-rock lifestyle of booze, cigarettes and more booze. The album is a little more rowdy, a little more raucous and a little more sing-along friendly. Grab your boots and leave your mild manners at home, and we’ll see you tonight at The Tractor. 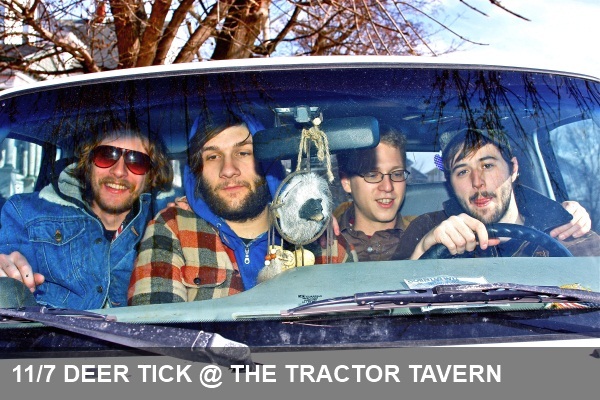 11/7 Deer Tick / Guards / The Barr Brothers @ Tractor :: $15 SOLD OUT :: Doors at 8 p.m.